This is so cute. That dog must have very strong parental instincts. I know this, because Miley would be busy carrying that little rabbit around in her mouth. Little rabbits might be cute, but they are more fun to carry around. The St. Roch collar form Pete's Dog Gear. I am pleased to announce the first contest ever held on Retrieverman. The votes will be used to increase my ranking on http://www.blogtoplist.com/pets/. You can vote once a day, but only one comment per voter will be considered. I can trace IP addresses, so please leave just one comment. I am leaving taking down the comment moderation of this blog to allow both newcomers and regulars to comment under the same conditions. So here we go! Happy voting. Happy commenting. And the best of luck to you all! Contest is now closed. Thanks for participating. The winner will be notified tonight by 10 PM EST. This dog is an IWS mixed with either golden or flat-coated retriever. A liver IWS bred to a golden with black pigment will produce black puppies. Here’s her profile at Black Retriever X Rescue. This cross tells me that IWS are not that distinct from the other retrievers, and the old name “Irish retriever” may be a better way of understanding what they are. Water spaniels are ancestral to retrievers, but this particular breed of water spaniel still exists. It’s the only one left in the whole of the British Isles. Most people think all spaniels are land spaniels, but even retrievers can do spaniel work. Goldens can do the same behaviors for which English springers are known. The line between retriever and spaniel is a bit fuzzy, although the main retrievers have “Newfoundland” ancestry that spaniels don’t have. I read a source that said some St. John’s water dogs were cross with IWS at some point, but I haven’t been able to verify it. The extinct Tweed water spaniel was a mixture of St. John’s water dog and some kind of water spaniel. It looked more or less like a yellow or reddish curly-coated retriever with just a bit more bone. I’m sure the Murray River curly-coated retriever folks who read this blog will be interested in looking at this dog. She resembles their dog very closely, but she’s black in color. Also compare this dog with the late Shuttle, the golden who used to be in my header. Their heads have similar shapes. 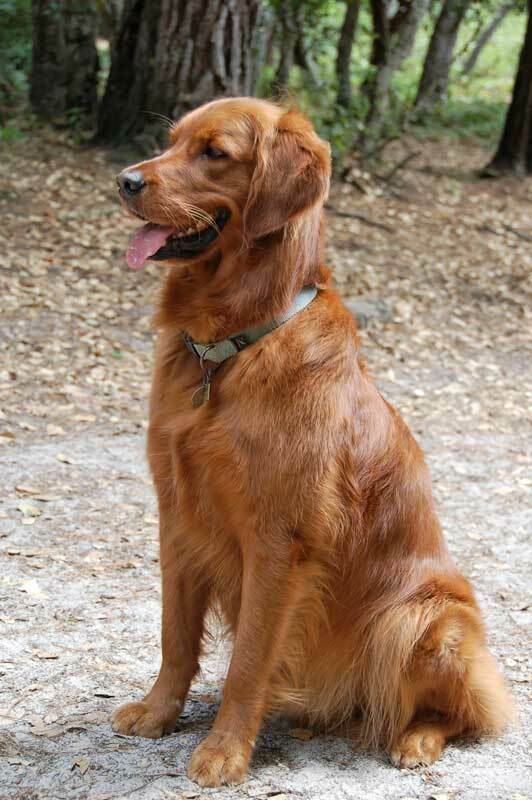 We may call this dog “red.” As you can tell from the name in the JPG file. 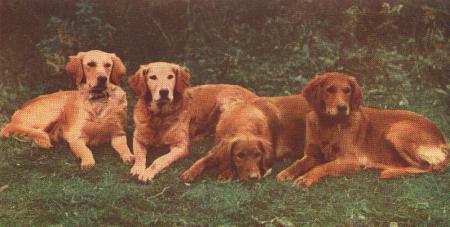 However, dogs of this color were always within the accepted range of golden retriever color. Just not in the UK or the FCI. Djanick Michaud at Zomarick golden retrievers suggested that I include the color range for the breed. He has a very good color chart on his website. This dog’s name was Leo and he was depicted in Stonhenge’s The Dogs Of Great Britain, America, And Other Countries (circa 1880). 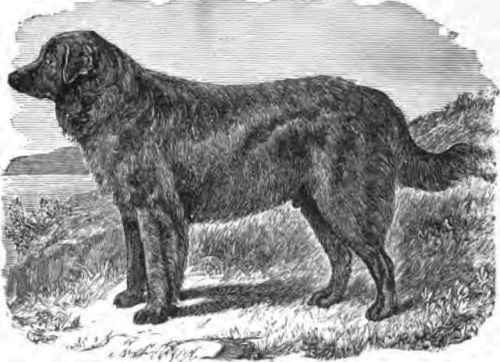 Stonehenge (John Henry Walsh) argues contends that there are three types of Newfoundland: The “true” Newfoundland, the “loosely made” Large Labrador, and the St. John’s water dog. The first is the large black Newfoundland type. The “Large Labrador” is what we’d call a Landseer, and the St. John’s water dog. Leo is supposed to be a true Newfoundland, but he looks very much more like a modern retriever. 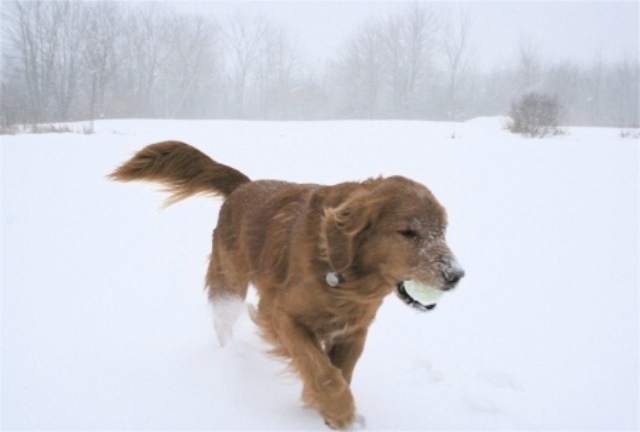 He was probably a bit larger than the typical retriever, but he would have been able to have been registered as a retriever, as could his progeny. Stonehenge makes the dubious argument that “pure” Newfoundlands on Newfoundland never exceed 26 inches in height, but when puppies those “pure” strains are bred in England, they become giants. Such a claim is quite. In that same section, Stonehenge says the big Newfoundland were being bred with mastiffs, and the St. John’s water dog was bred with the setters in that same section. So it is doubtful the giant size evolved on Newfoundland or that the nutrition in England would have been so much better that it could account for the size discrepancy. Newfoundland’s Grand Banks were producing high quality nutrition in the form of fish and other sea food that was being exported around the world. The US made a point to negotiate access to the Grand Banks as part of the treaty that ended our War of Independence. Dogs likely were well-fed and well-cared for, simply because they were such as asset to the fisherman and other settlers. If anything, the quality of nutrition would have decreased in England, simply because even middle class people would have had less access to the same amounts of good quality protein. It is more likely that hybridization with mastiffs accounted for the increased size, and I note that Stonehenge appears to be exaggerating how large the big Newfoundland was. The average weight of a Newfoundland was 85 to 100 pounds in 1900. This Landseer-colored Newfoundland was actually painted by Landseer. 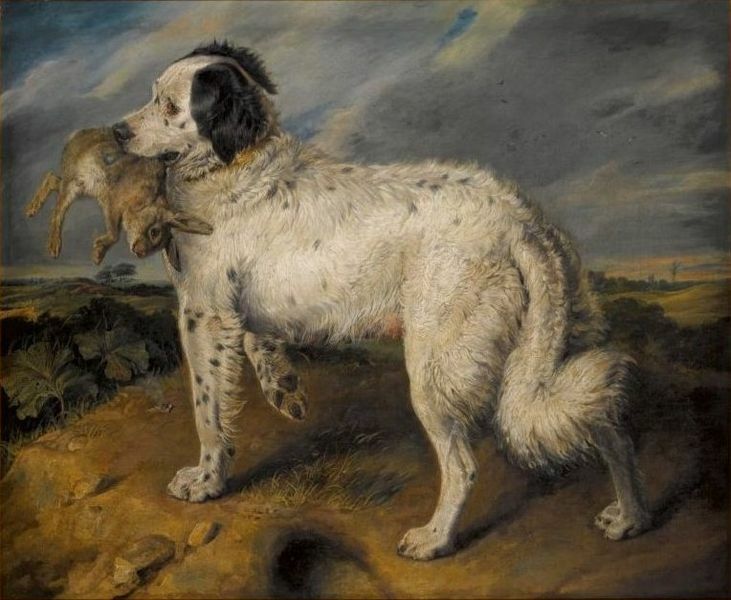 It is retrieving a European rabbit. Unless a Night of the Lepus situation had happened when this painting was made, there is no way this Newfoundland was a giant dog. The proportions of the rabbit to dog suggest that the dog was more in the 80 to 100 pound range. A big dog, but not a giant. It is very likely that all of these Newfoundlands contributed to the development of the retrievers, but the St. John’s water dog is the most important. Also check out the Caniformia video to see how the whole order Carnivora evolved from common ancestors that looked like genets or genet/fox hybrids. He mislabels a few species- snow leopards, clouded leopards, and the ocelot. And at least one Pantherine cat has hybridized with a “small” cat. The cougar and leopard have produced “pumapards.” Also, modern cheetahs evolved in the Old World, but they do share common ancestry with cougars and jaguarundis. The ancestral cheetah entered the Old World, but it was more like a cougar than a cheetah. However, there were North American cheetahs, but they were more closely related modern cougars and jaguarundis than Old World cheetahs. The cougar cats have evolved cheetah-like characteristics twice: once in the Old World and once in the New World. 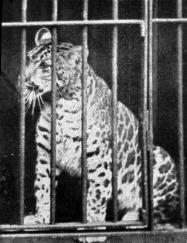 The New World “cheetahs” evolved first, but they are not ancestral to the Old World cheetah species. Despite these little quibbles, this is an excellent video, and it should be watched with the Caniformia video to really understand how dogs, cats, and other Carnivora species evolved. Paris should enjoy her little fashion accessories while she can. They only exist in their current form because of a lot of human intervention. And with each generation, more intervention is necessary.